Well, the suspense and waiting ALMOST did me in! 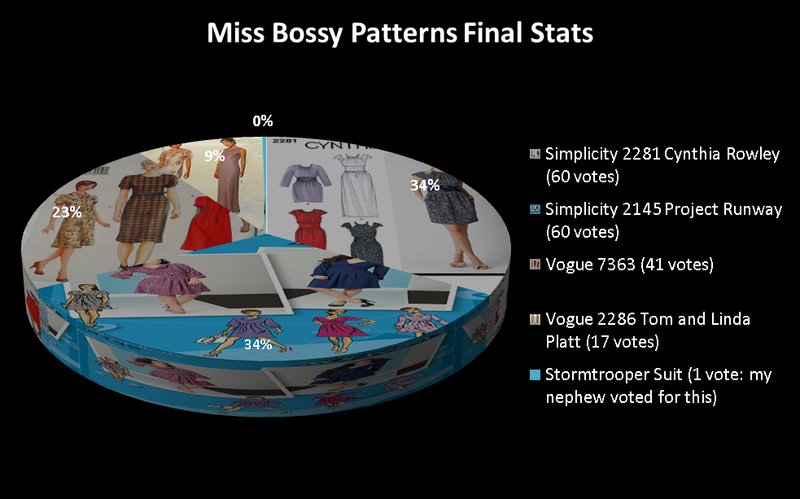 178 wonderful folks voted on my March Miss Bossy Patterns poll and I want to thank you all so much! (And, I set it to ‘no repeat voting’ so you know it wasn’t just my mom voting 177 times). For the first half of the poll, the Project Runway, Cynthia Rowley and the vintage looking modern Vogue were all neck in neck with Tom and Linda Platt coming in fourth place, getting a fair number of votes, but not enough to catch up with the rest. Then, for the second half of the poll, there was a ferocious battle between Project Runway and Cynthia Rowley, first with a tie, then folks would break the tie and one of the patterns would be ahead, then another tie! This went on for a week. Since I can’t promise to sew both this month, tells you what I’m gonna do. Some of you voted based on fabric with the most popular fabrics being the black and white (paired with the Project Runway) and the paisley (paired with the Cynthia Rowley) so, I’m going to pull the ol’ switcheroo. Cynthia Rowley dress sewn with black and white paint splash design fabric and fully lined with purple bemberg rayon. Project Runway dress sewn with rayon blend paisley fabric and bodice lined with pale blue cotton blend fabric. 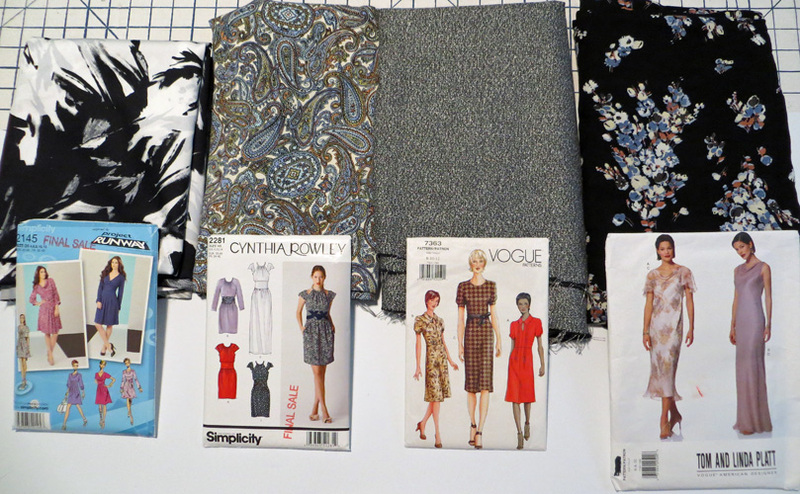 I am pairing the black and white fabric with the Cynthia Rowley and the Paisley fabric with the Project Runway and will sew one of these combinations, which will be a surprise for you (and me)! I think this will work well because the Cynthia Rowley dress is more dramatic and modern while the Project Runway dress is more classic. Whaddya think? Any objections? Proposed Alternatives? 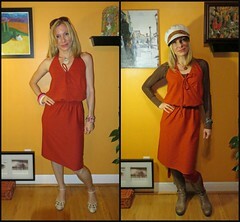 PS: Have you entered my Sew Grateful Giveaway yet? 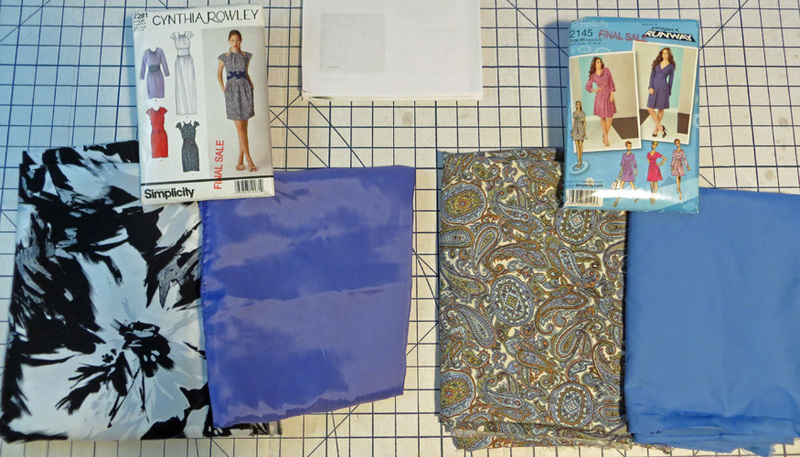 I’m giving away a bunch of sewing stuff like magazines, patterns and fabric. Pop over to enter! Sounds a good compromise to me – go for it! Excellent, thanks Del! /\ I think I actually prefer the reverse combinations! “Tells you what I’m gonna do”…LOL, you’re so cute. Sounds like a plan for success Catja. Have you decided which view to make on the Cynthia Rowley? The butterfly sleeves with the cut out shoulders is fun. I’m sure which ever one you sew is going to look fab. Thanks Kelly! For the Cynthia Rowley dress, I actually really like the cut out shoulder version. However, a very practical reason has swayed me from choosing it. When I was younger I got so much sun on my shoulders and also blistering burns! They went from porcelain white to hundreds of freckles. I’m actually afraid that any more sun on them will cause permanent damage. Sooo, I am going to go with the short sleeve view. Not sure if you can see from the photo, but the sleeves actually have two tucks on them on the top, so they are very different from a regular short or cap sleeve so should also look a bit different and dramatic, similar to the the cut-outs. Oh, sorry, forgot to tell you how I made the pie chart (CHART!!) I made it in MS excel, and you can select ‘fill’ options for the chart. I selected photo and simply input these photos as the fill. Makes for a neat effect, doesn’t it? Oh, ps. Did you see the Oscar presented for best costume design? Was Catherine Martin for her beautiful work on the Great Gatsby and she’s actually married to Baz Luhrmann. I didn’t know that. I bet the decor in their home is awesome. She also won for Moulin Rouge which I loved so much. I did not see the Oscars, I hab a bit of a code and tuffy node so went to bed early. I am so excited to surf the interwebz today and see all the dresses and winning costumes! There were some exquisite outfits in the Great Gatsby! Not sure they all were true to period, but I think that’s how it was meant, to combine 20s period and some modern to create a new look. I’ve not yet seen Moulin Rouge, eeep! Ha ha – excuses, excuses! OK, will let you off, but I really want to see the Project runway one made up – it’s in my stash waiting. We could be twinsies! Ooh, giveaway, I’m heading over NOW! I actually like the fabric pairing better now! 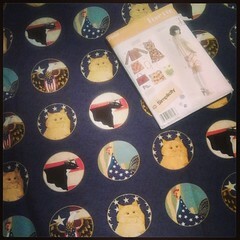 But, will have to have Kitty select the pattern to sew first, since I can’t decide. And, I was actually pretty tempted to sew the Stormtrooper suit!! Great plan for switching, it keeps it fun. I look forward to seeing what you make. Thanks! Since I couldn’t decide between patterns and since they ended up as a tie (oh, the suspense of waiting seriously almost killed me) I thought a little from column A and a little from column B would be like a tie breaker. Great idea! 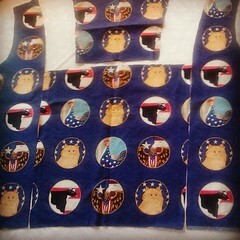 I love the Project Runway pattern (that’s what I voted for! ), so I shall look forward to seeing it. Good luck with both of them! Thanks Lynne! I’m actually just right now reading the directions for both to see which one to sew. Oh that will be nice! Can’t wait to see the results, go Katja go! Yay, thanks Jagodas! My own personal cheering section 🙂 . Dang I missed the voting. Well it all sounds grand anyway! Will be keeping posted! Aw shucks! Your vote could have been the one that broke the tie and declared a winner! Just out of curiosity, which pattern would you have voted for? Yes! This is perfect! The paint splash onthe pattern with less seam lines breaking it up. Yes, yes. Ooooh, a resounding positive response! Awesome! That would look nice! I have a piece of challis that has a repeat, but it is a biiiiiig repeat, 3 across, but it actually might look really nice with the Project Runway dress. The paisley fabric just has such a lovely drape to it, it really ‘flutters’. I will dig out the challis and see how it might look. 🙂 I dug it out but its a bit too scary. It is a vertically directional as well as horizontal repeat. I’d have to match up front and back bodice, front and back skirt as well as have both sleeves the same. May be too advanced for me right now. You have no idea! It was touch and go there for most of the race and I almost didn’t make it out alive! :). Apparently online sewing polls are far too stressful for me. Here’s to the ol’ switcheroo!